Loosely inspired by a true story - very loosely inspired - 2015’s Danny Collins introduces us to the title character (Al Pacino). An elderly rock star in the Rod Stewart/Neil Diamond vein, Danny coasts on prior glories and does nothing to challenge himself. One day Danny receives a letter than John Lennon sent to him in the 1970s. Danny didn’t know this missive existed until present day. Lennon offered Danny encouragement, and Danny believes that his life would’ve gone differently had he received it. Danny decides to make up for lost time. Danny wants to revive his creative juices, and he also seeks out Tom Donnelly (Bobby Cannavale), the estranged son he barely knows. We follow these endeavors as well as Danny’s potential romance with Mary Sinclair (Annette Bening), the manager of the hotel where Danny takes up residence. At this point in his career, I don’t expect a lot from Pacino. To be honest, if he can avoid a certain level of obnoxious hamminess, I view his work as a success. Pacino doesn’t need to be good; I’m happy if he’s just not terrible. And Pacino achieves that, as he offers a generally competent performance in Collins. This doesn’t mean I feel he offers a great turn, partly because he never seems believable as a rock star. He can’t sing, he shows no stage presence and he displays no knack for music. When outside of the musical sphere, Pacino goes for cutesy too much of the time, but at least he doesn’t shout all his lines and bludgeon us. Again, this may not be praise, but compared to many other modern-day Pacino performances, I count this as a relative success. To some degree, I don’t blame Pacino for his deficiencies here, as the script creates many of its own problems. Collins feels contrived, as it comes with artificial dialogue and cliché characters. The story puts its desires ahead of logic, and this becomes more and more of a problem as the flick progresses. Man, does Collins embrace melodrama! For a while, it looks like it might create a decent story of maturity and redemption, but it chooses so many forced and phony paths that it becomes ridiculous. These actively sabotage the movie. Huge chunks of the tale make no sense. For instance, everywhere Danny goes, people go crazy – even college students. He also boasts hot groupies backstage at his show. However, when we see Danny’s audience, we only observe the super-elderly. The movie doesn’t even put 60-somethings in the crowd – it looks like the casting department opted solely for those 80 and up. So let me see if I get this: no one born after the Great Depression listens to Danny, but all generations know and love him. Really? That’s just one of many problems with this contrived, unbelievable effort. With a good cast and a decent concept, Collins boasts the potential to go somewhere. Unfortunately, it veers so far into the world of silliness to keep us involved. Danny Collins appears in an aspect ratio of approximately 2.40:1 on this Blu-ray Disc. The movie delivered a terrific transfer. Sharpness looked strong. If any softness materialized, I didn’t see it, as I thought this was a tight, concise image. I witnessed no shimmering or jaggies, and edge haloes remained absent. As expected, the film lacked any print flaws. In terms of palette, Collins went with a mix of orange, teal and amber. It didn’t overwhelm us with these choices, but they dominated. Within the stylistic choices, the hues seemed fine. Blacks were deep and tight, and shadows looked smooth and clear. Everything about the image worked well. Though not exceptional, the movie’s DTS-HD MA 5.1 soundtrack suited the story. This meant the soundscape accentuated general atmosphere and not much else. Even concert performances didn’t do a ton with the various channels, and the rest of the mix emphasized environment. These elements added a little breadth but not much. The Blu-ray offers two bonus features. 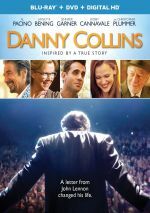 Behind the Scenes of Danny Collins runs three minutes, 44 seconds and provides comments from writer/director Dan Fogelman, and actors Al Pacino, Jennifer Garner, Christopher Plummer, Bobby Cannavale and Annette Bening. We get thoughts about story/characters and the cast. This becomes nothing more than a glorified trailer. Album Covers Through the Years gives us a still gallery. It shows 10 “Danny Collins” covers from his “career”. These aren’t very interesting, mainly because they look so fake. An artist of Collins’ stature would’ve had much more attractive album covers; these look like they were churned out quickly and without much care. The disc opens with ads for I’ll See You In My Dreams, My Old Lady and Pawn Sacrifice. No trailer for Collins appears here. A second disc provides a DVD copy of Collins. It includes the same extras as the Blu-ray. As a character drama, Danny Collins comes with a moderately interesting premise but it doesn’t amount to much. Too much of the story seems thin and contrived for the film to develop in a satisfying manner. The Blu-ray brings us excellent visuals as well as adequate audio and insubstantial extras. Collins brings us a sporadically decent melodrama and that’s about it.